Brooms Up is coming! The truck will be here Saturday and Sunday. Sunday Lunch: Assorted Items (aka All Your Favorite Meals ....... ) leftovers! Pre-Orders are closed. A limited number of additional shirts will be available Friday. Show off your favorite local brewery. Bring a 6 pack to hoist onto our wall of beer. 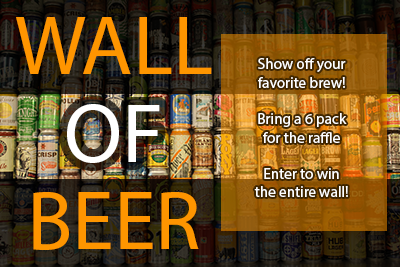 During the spiel, you can buy raffle tickets to win the wall of beer. If you bring a 6 pack, you will receive 2 free raffle tickets. Drawing Saturday @ Lunch. Think you’re witty? Want to shake things up? For $3 we will print out your message and put it on one of our stones! Want to get someone back? 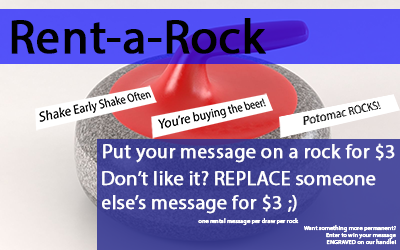 REPLACE their message with your own for $3 ;). Start coming up with your best curling puns now! 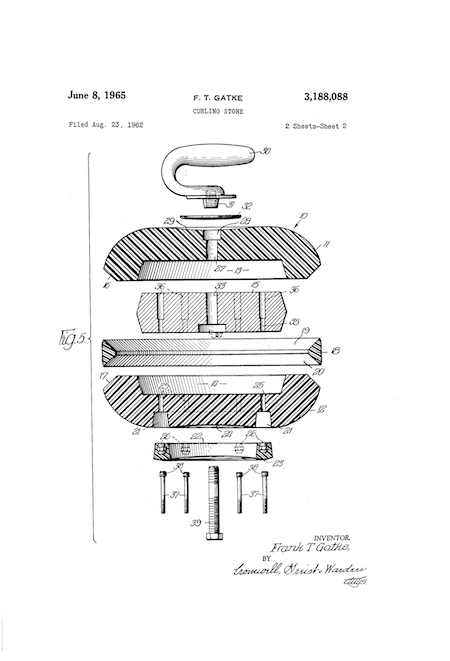 The first 5 draws will feature the completely original … cough *cough … BOX GAME! A clean draw to the 4 foot or a double takeout (of your opponent’s rocks, not yours’!) gets you the box. If your team is in possession of the box when the bell rings, you win! Day and Evenings both Uber and Lyft are available near the Potomac Curling Club. One way trips are $7-$10 (just in case you need a ride…). But if you do plan to Uber/Lyft, please leave your car at the hotel. During the day the hotel shuttle should be available. 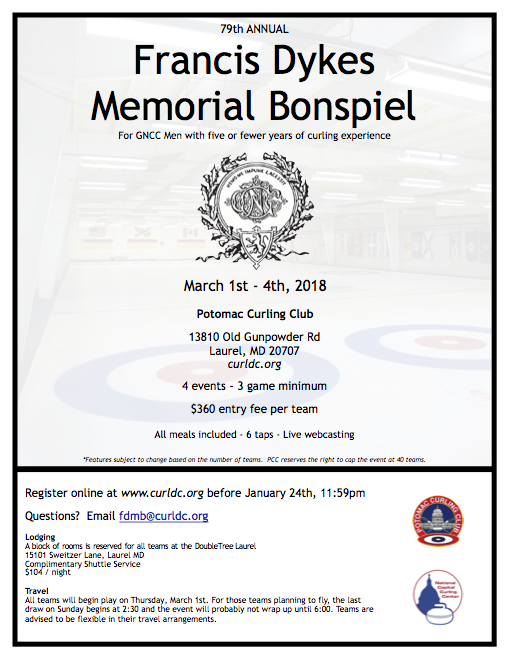 Mar 1-4, 2018 - Bonspiel! All teams will begin play on Thursday, March 1st. For those teams planning to fly, the last draw on Sunday begins at 2:30 and the event will probably not wrap up until 6:00. Teams are advised to be flexible in their travel arrangements. This event is open to GNCC members over 21 with fewer then 5 years of experience. All teams must submit a completed Player Verification form signed by their club president or designee. Potomac Curling Club reserves the right to cap this event at 40 teams. In the event that more teams apply then are allowed, the member club (not PCC) will determine the order of team entry for their club. (Club presidents will be emailed their club's entries). If no response is received within 7 days, the order of team entry will be determined by timestamp. (4) At least one rink from each GNCC member club shall be accepted. To the extent that the host club can accept additional teams, one additional team will be accepted from each GNCC club submitting more than one team. If space permits at the host club, one additional team will be selected from each club submitting multiple entries until the maximum number of teams the host club can accommodate is selected. It is the responsibility of the GNCC member club to place their multiple entries in numerical order for selection.